A 21-year-old man from Oxford, who travelled to the Islamic State-controlled area of Syria in 2014, has told the BBC he is now being held by Kurdish forces fighting the group. 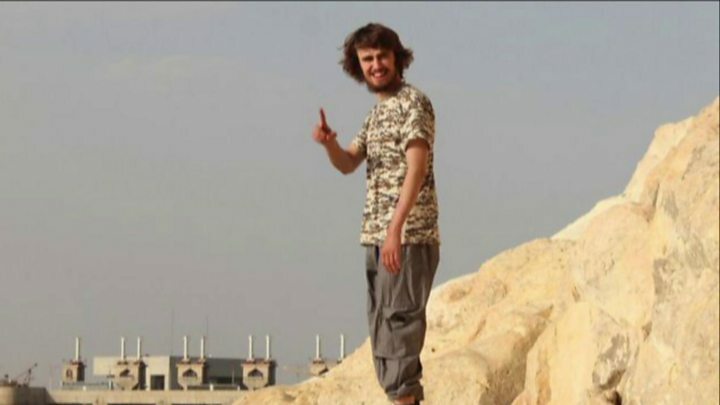 Jack Letts, dubbed "Jihadi Jack", is suspected of going to Syria to fight for so-called Islamic State. But he claims he is opposed to IS and has left that area. Mr Letts spoke to BBC home affairs correspondent Daniel Sandford via text and voice messages. Speaking about leaving IS-controlled territory, Mr Letts said: "I found a smuggler and walked behind him through minefields." Mr Letts converted to Islam while at Cherwell comprehensive school in Oxford. He travelled to Jordan, aged 18, in 2014, having dropped out of his A-levels. By the autumn of that year he was in IS-controlled territory in Syria. He told the BBC he had been injured in an explosion and had gone to Raqqa, the de facto capital of IS in Syria, to recuperate. "It was the news we've been waiting for for three years - ever since he went out there - and now we just want to get him home," said Ms Lane. They believe their son is not being treated badly but are concerned about his mental health. Neither they or the BBC have heard from him since 1 June. Mr Letts' parents are calling on the British authorities to do "whatever they can" to help him. The government had told them that they could only help if he left IS-controlled territory but now he is out "no-one wants to take responsibility", said Ms Lane. Mr Letts, an organic farmer, acknowledges that his son "will have to account for his actions" once he returns to Britain, but the family is not convinced "he has done anything at all", from what he has told them. "If he has had anything to with IS I want nothing to do with him," said Mr Letts. "I think there has been so much misinformation, one little piece of information came out and it was manipulated, twisted, as far as I can see," said Ms Lane. In a statement, the Foreign Office said: "As all UK consular services are suspended in Syria and greatly limited in Iraq, it is extremely difficult to confirm the whereabouts and status of British nationals in these areas." Asked by the BBC why the UK government should help him, Jack said: "I don't want anyone to help me. "I'll just chill here in solitary confinement 'til someone decides it's easier to kill me."